We currently have a few types of materials: Aluminum, Stainless Steel, Corten Steel and Fiberglass. The type of material you should choose may depend on your weight, budget and customization needs. If you are leaning towards aluminum, there are ways to keep the weight of aluminum down. We have Ez-Fill-ter bags. They are bags filled with non-biodegradable foam that is used to fill the void of planters. This makes it so that you don’t have to fill the entire planter with soil, making it easier to use for decks or weight-restricted areas. If you are on a tight budget, fiberglass is the way to go. It’s lightweight, extremely durable and weather resistant. If you need a specific size or shape, any metal material will be the way to go. 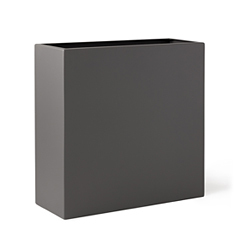 Our fiberglass planters come in set sizing due to the molds that we had curated. Can I customize my planter? Yes! 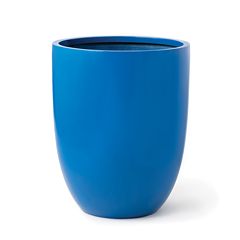 All planters can be customized for color and metal planters can also be customized for size and shape. If you need a specific color, send us an RAL number. Drainage holes are necessary if you are using the planter outdoors. 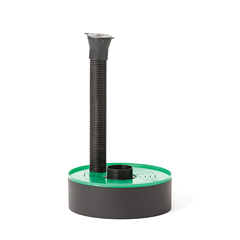 If you’re using a planter indoors, we highly suggest to use a sub-irrigation unit to keep your planter tidy. What is the best way to water the plants? Is there a self-watering option? We are also able to create metal planters without a top lip and return, though limited in size. We suggest planters that are wide and are tall to allow the roots of the tree to spread around and also to give enough space to hold up the tree. If the planter lays on soil, we can create a custom bottomless planter so that the roots can continue to grow deeper. I need a specific-size planter, what can I do? We specialize in custom planters! With our experience, we will be able to provide you with any size, shape, material and color.